Diversity Research Talks typically engage health research. These presentations s are brown-bag lunch conversations facilitated by scholars within the Biological Sciences Division. The topics addressed include leadership development, health disparities, innovation, and diversity. These conversations/talks are free and open to the public. 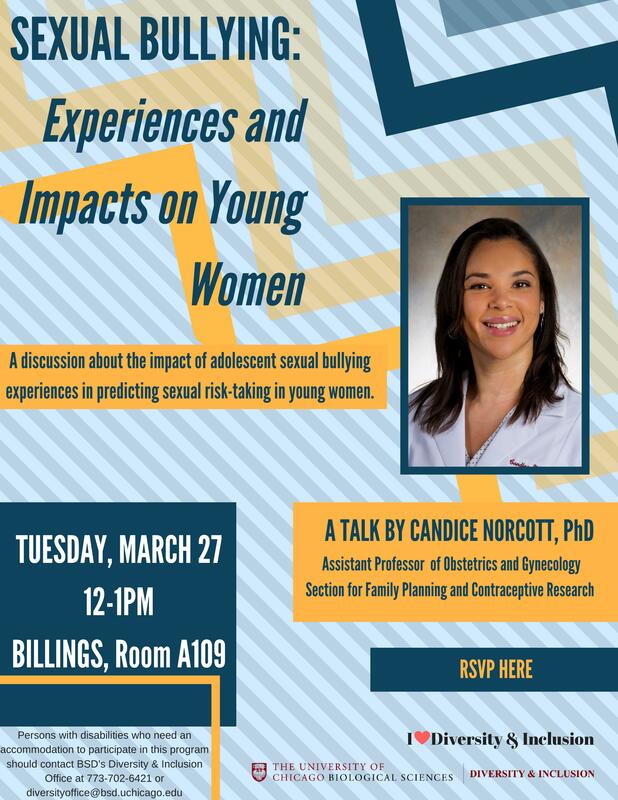 Join Dr. Candice Norcott for a discussion about the impact of adolescent sexual bullying experiences in predicting sexual risk-taking in young women. Throughout her career, Dr. Norcott has been committed to trauma-informed and gender-responsive services for girls and women, minority advancement in psychology, and educating on cultural responsiveness in the health field. She is a recipient of a Diversity Research and Small Grants Program grant from the BSD Office of Diversity and Inclusion. The office of Diversity and Inclusion has held a number of Diversity Dialogue events. This page lists previous Diversity Dialogues. See below for more details. Dr. Shellie Williams is Assistant Professor of Medicine in the Section of Geriatrics and Palliative Medicine. She practices both Geriatric Medicine and Palliative Medicine in the hospital, clinic, longitudinal care and home settings. 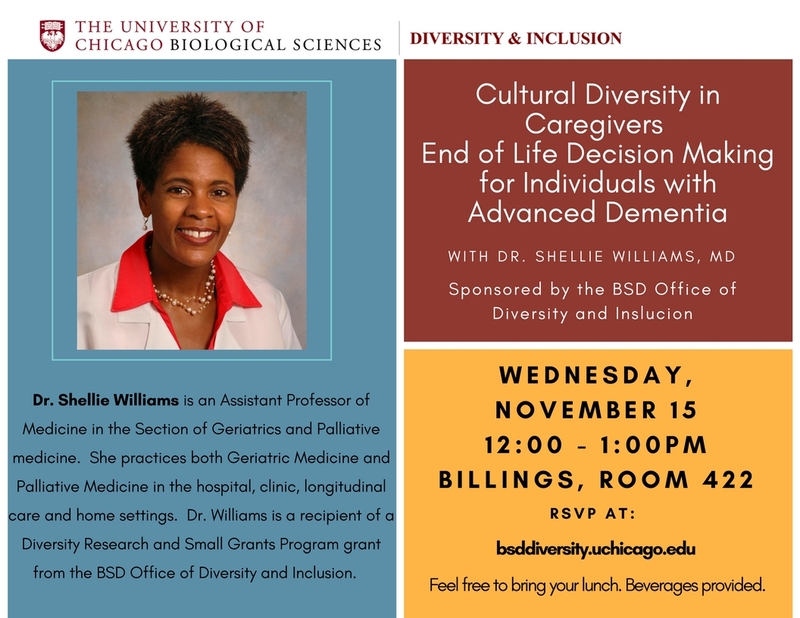 Dr. Williams’ talk will address the cultural complexities involved in making end of life decision for individuals with advanced dementia. 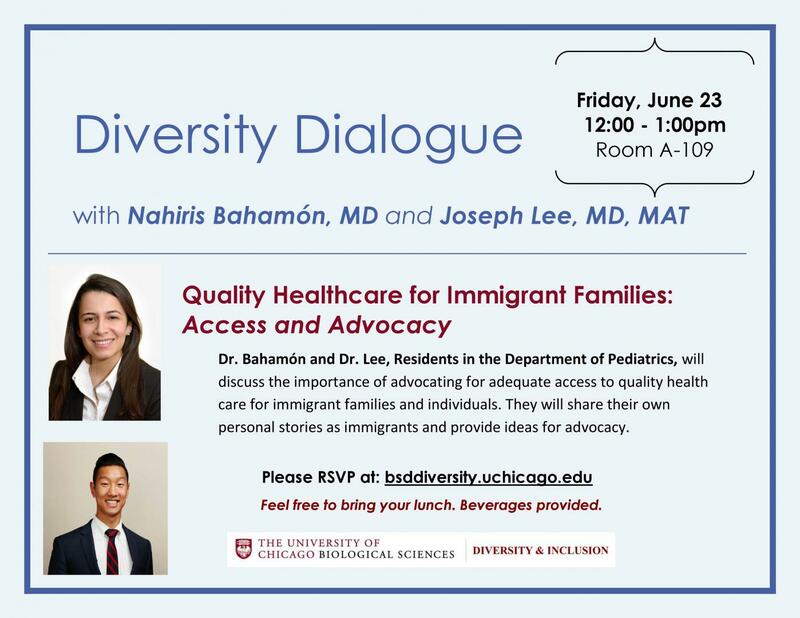 Nahiris Bahamón, MD and Joseph Lee, MD, MAT – June 23, 2017 – “Quality Healthcare for Immigrant Families: Access and Advocacy” Dr. Bahamón and Dr. Lee, Residents in the Department of Pediatrics, will discuss the importance of advocating for adequate access to quality health care for immigrant families and individuals. They will share their own personal stories as immigrants and provide ideas for advocacy. Darnell Motley, PhD, June 9, 2017 – “HIV-Positive Young Black MSM: Navigating Intimate Relationships & Cultivating Strengths” Darnell N. Motley, PhD, is a scholar-practitioner who divides his time between clinical practice, research, and education. Currently, Dr. Motley serves as the Postdoctoral Fellow in LGBT Healthcare at Hines VA Hospital. In this role, Dr. Motley is charged with providing care to LGBT veterans presenting with a range of mental health concerns and providing education to other professionals serving this population. Donna Lemmenes, January 26, 2017 – “Does race impact nurses’ perception of ethical climate?” Investigators have reported that Black nurses are more likely to leave their positions and experience more ethical stress compared to their non-Black colleagues. Researchers have identified negative correlations between ethical climate and ethical stress in nurses; however, few have examined difference in perceptions of ethical climate across race. We chose to examine nurses’ perceptions of ethical climate and relationships among ethical climate factors and nurse characteristics. Findings suggest future research is needed to explore differences identified as well as the development of interventions for groups identified as having lower perceptions of ethical climate. 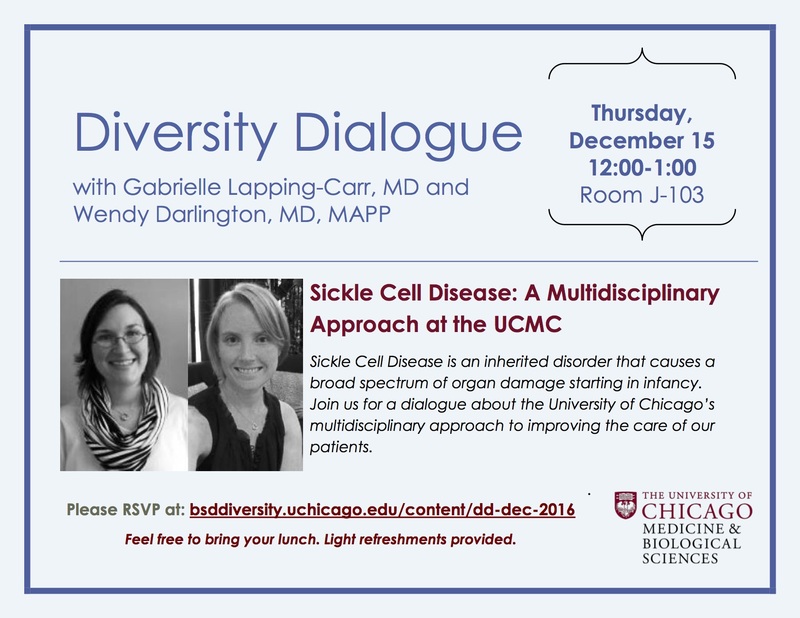 Gabrielle Lapping-Carr and Wendy Darlington, December 15, 2016 – “Sickle Cell Disease: A Multidisciplinary Approach at the UCM” Sickle Cell Disease is an inherited disorder, primarily occurring in AfricanAmericans, that causes a broad spectrum of organ damage starting in infancy. Patients may experience chronic pain, strokes, lung disease, kidney disease as well as other problems. At the University of Chicago we have developed a multi-disciplinary approach to understanding the disease and improving the care of our patients. During this discussion we will describe our current work and why our multi-disciplinary approach is so critical to making an impact.